Price is per four of these beautiful beads. Drilled ready to thread - as in picture. Each measures a large 40mm x 29mm x 10mm. Chinese Turquoise is a soft, opaque gemstone. Ranging from blue-green, to yellow-green with grey, black or brown veining . Much Chinese turquoise was used for artistic carving and jewelry, which has always been popular in the Orient. In China, Turquoise dates to the thirteenth century A.D. Although most brought from trade with the Persians, Turks, Tibetans, and the Mongols. 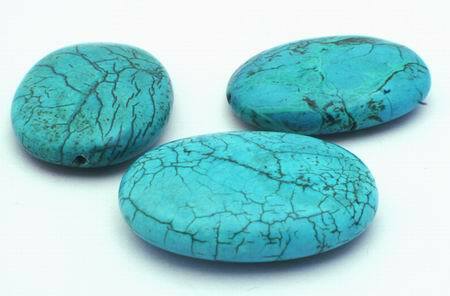 Tibet had it's own source of turquoise usually a green cast, very hard stone with significant amount of spider webbing. The Tibetans highly revered turquoise and was used in many areas as currency.